Bloggin' 'bout Books: Beyond the Books: Mo' MoTab (& Friends), Please! If you're a member of The Church of Jesus Christ of Latter-day Saints, you're no doubt looking forward to this weekend. Twice a year, the LDS Church holds a General Conference, which takes place in the Conference Center in Salt Lake City and is broadcast all over the world. My family loves going to church in our pajamas (we watch Conference on our t.v. at home), eating traditional foods (French toast for breakfast is a Conference must), and, most of all, listening to inspired counsel from our Church leaders (glorious!). I always come away from the experience feeling closer to my family and to God. 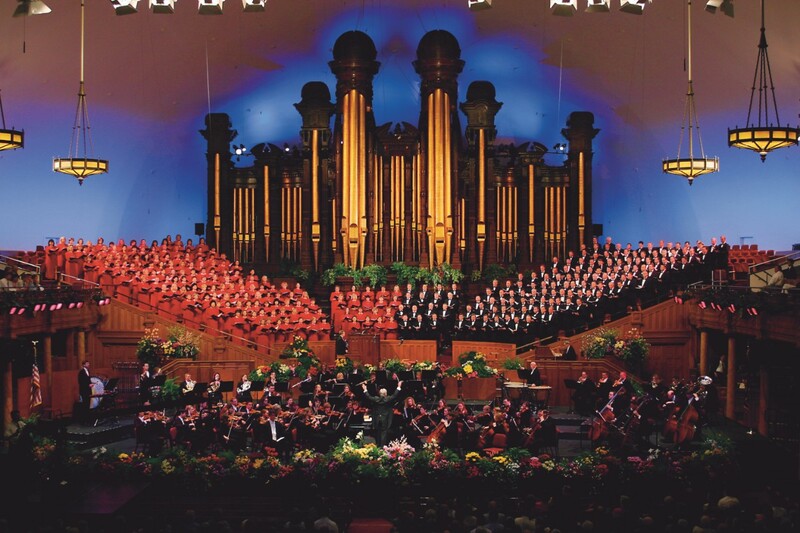 Of course, Conference wouldn't be Conference without the world-renowned Mormon Tabernacle Choir. In between the talks, the 360-person, all-volunteer singing group performs songs of faith and devotion, which always bring a special spirit to the proceedings. While watching the choir on t.v. is powerful, it's nothing compared to seeing the group perform live. If you happen to be in Salt Lake City, you can catch free performances every Sunday during the taping of the Music and the Spoken Word program. Weekly rehearsals are also free and open to the public. There are additional concerts throughout the year. 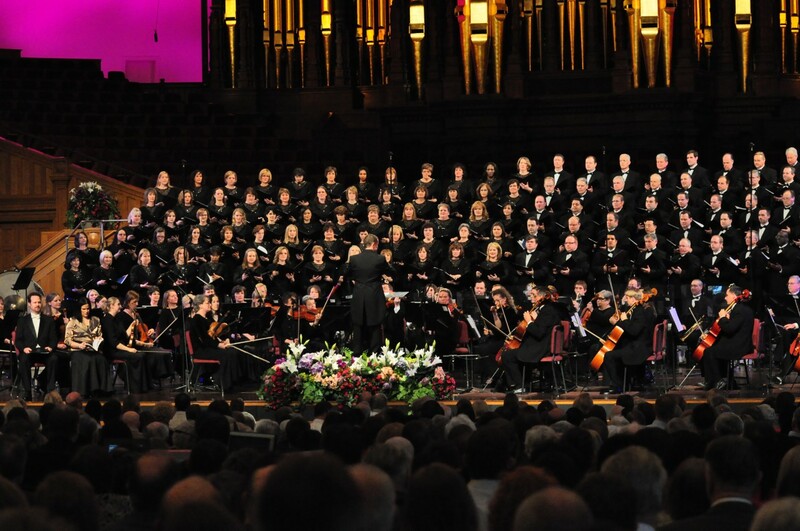 Information about all of these events can be found on the Mormon Tabernacle Choir's website. 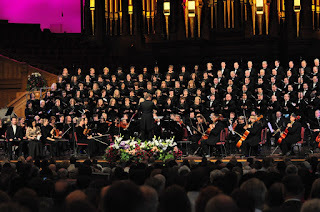 Even if you can't catch MoTab live, you can still listen to its music. Check out the commercial-free, 24/7 music stream at the Mormon Channel, for instance. You can also find CDs at Amazon, Deseret Book, and other retailers. 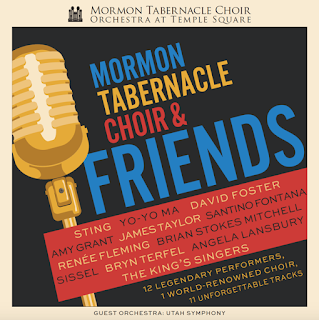 If you love the choir's rich, inspiring music, you'll definitely want to check out its newest CD, Mormon Tabernacle Choir & Friends. 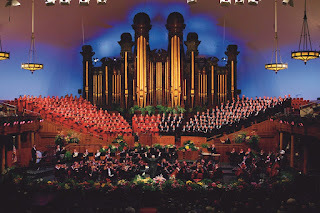 The album features eleven tracks from the choir and the Orchestra at Temple Square, seven of which are from standout concert performances over the last 15 years; the other four were created specifically for this CD. Each song stars a guest artist or two, from Yo-Yo Ma to James Taylor to Angela Lansbury to Santino Fontana. The tracks range from African-American spirituals to songs from popular movies to old favorites like How Can I Keep From Singing? It's a soothing, sometimes rousing collection that can be enjoyed by listeners of all ages. Seriously! My favorite track on the album is "Through Heaven's Eyes" (from The Prince of Egypt), which happens to be the movie song my 8-year-old sings most. Released in May, the album quickly reached No. 1 on Billboard's Classical Crossover Chart, the 12th time that a Mormon Tabernacle Choir album has done so. It also earned the No. 2 spot on the Classical Overall chart. If you've got a MoTab lover on your Christmas list this year, definitely pick up one of these babies. Also, keep in mind that Deseret Book stores across the nation will be hosting Ladies Night on Saturday, September 30. Almost everything in the store will be 20% off, making it a perfect night to get a Mormon Tabernacle Choir & Friends CD of your very own. *To the FTC, with love: I received a free Mormon Tabernacle Choir & Friends CD in exchange for an honest review from the generous folks at Deseret Book. Thank you!